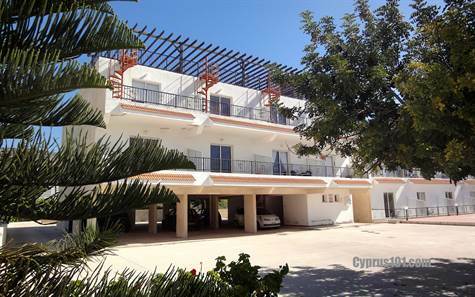 Peyia, Paphos - This spacious one bedroom apartment is located in the popular village of Peyia within easy walking distance to local amenities. The property features an open plan living room with patio doors providing easy access to a wide covered balcony with a pleasant rural aspect and partial sea views. The bedroom is double size and has fitted wardrobes. A large fitted unit near the entrance provides further useful storage. The communal pool area is well maintained and has a large terrace surrounding with lots of space for sunbathing and relaxing. Covered parking is available and title deeds are available. Please refer to MLS#: 1256 when inquiring.